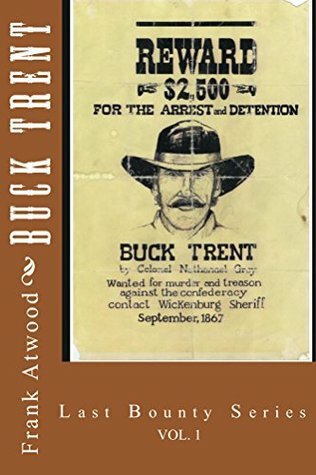 Set in the Arizona Territory, 1875, Buck Trent by author Frank Atwood is a fast paced novel with authentic, engaging characters. It is raw, gripping, and immensely entertaining, reminding me in its grittiness of the TV Western, Deadwood, and E. L. Doctorow’s book, Welcome to Hard Times. It is a non-romantic look at what the West was really like post Civil War: prairie justice, uncertainty of life, outlaws, treachery, wolves, rattlesnakes, danger at every turn. Yet there is morality and a hero to root for. For me it was a page-turner. I read it while visiting Texas, the perfect place to read about the West in this rough period of time. The book starts with a kick, someone shooting at Buck Tent, but he doesn’t know why and therein lays the thread that unravels throughout. Buck finds there is a bounty on his head but again, no idea why. Who is shooting at him? Who put a bounty on his head and why? The unfolding of these questions takes the reader through three different friendships, two long standing and one that emerges. Atwood skillfully uses different viewpoints, keeping the pacing taut till three stories converge in an inevitable rendezvous with danger, death and a fight to the end. He paints characters and scenes with a broad brushstroke that is evocative and vivid—I immediately got an image and a sense of each person. He shows five main characters, all very different, revealed by their actions, behaviors, and responses to people and situations, their moral fiber or lack thereof. It is a remarkable skill to use sparse language that gives such a strong sense of the person. Even the laconic speech is perfect, mirroring the raw landscape, external and internal. There is plenty of action yet it is a story of strong friendships and loyalty. Adding to the authenticity of the story is Atwood’s knowledge of the era, the technicalities of guns, and the subtle behavior of horses. Without giving the story away, this is nontraditional in more ways than one: the main characters are two Civil War soldiers; two Black men, one an ex-Buffalo soldier; and a powerful, wealthy former plantation owner and his foreman. With Atwood’s visual, cinematic writing, I could easily see this as a movie or miniseries. I have one small caveat: there are proofreading errors but that is small stuff compared to the wonderful storytelling, the masterful use of different viewpoints through three sets of friends, the perfect pacing that kept me fully engaged and wanting to pick the book up every chance I got. 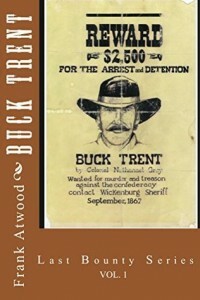 Buck Trent is volume one of the trilogy, The Last Bounty Series. Truly a great Western, I look forward to more from author Frank Atwood.